For this glorious Week of Dina, I had the pleasure of chatting with the Dina herself about one of my favorite topics – the middle ages. Her new book, Dance of the Dandelion, is set in medieval England in the early part of the 14th century, and we got a chance to talk about why she made that decision and other medieval delights. DeAnna: Tell me what interested you in the medieval period before you wrote your book. Why did you set your story there and not in a different time period? Dina: When I started writing Dandelion I knew nothing about markets and trends. I just knew what I liked. Also at the time, I hadn’t decided if I would aim the books at a secular or Christian audience. I wanted to set the book before the Protestant Reformation because I thought it would be a great way to explore spiritual themes in an environment where they would seem organic. The medieval period seemed like a perfect opportunity to have a Christian world view book without being too overtly Christian in the preachy sort of way that annoys secular readers. During that era, everyone was Christian, but being Christian didn’t necessarily mean much. I also thought it would be great to look at Christianity in a different context, before our current Christianese dialect and denominational schisms. Finally, I've been very inspired by Christians from the medieval period. I love the poetry written by the saints of that period, and I wanted the book to reflect their intense spirituality. So that’s the main reason I chose the medieval period. Knights, castles, and tournaments were just a bonus. Of course in the end, the spiritual aspects of the book really took on a life of their own, and I realized I would have to go in the direction of a Christian publisher. DeAnna: The church was definitely a huge part of everyone's everyday life back then, whether or not each individual was truly living the faith. You made a great choice, then, for a place where the faith element would seem natural to the story, even to non-Christians. Dina: Can I turn around the question to you, DeAnna? Why did you choose it for your first series? DeAnna: I think for my books, besides the castles and the beautiful clothes and chivalry, I liked the idea that the king had such power over people's lives. I mean, these days you can fairly well live where you want and marry who you want and do whatever work you like. Back then, your choices were often much more limited, and your life could be dramatically changed at someone else's whim. I also wanted to explore the idea of what it would be like to be forced into a position of power you didn't want and didn't feel equipped for and to have your choices affect not only yourself but all your people. Plus I was heavily influenced by Shakespeare's history plays which are often family dramas with huge political stakes. I had to go medieval. Dina: To add to what you were saying, I think today we really don't understand what it means to make Jesus the "lord" of our lives. You get a much better concept of this when you study the medieval time period. And I have to say that I loved the way your main character in your book struggled with his role as king and what to do with that power. It was so wonderful. Precisely the way a godly man should respond to that role. DeAnna: Aww, thanks. I think I mostly just wanted to torture my hero a bit. So did you find anything in your research that surprised you or changed how you look at the medieval era? Dina: My book is very different since my main character begins as a peasant. It looks at a cross section of society from rich to poor and in between. Dandelion travels to castles, to London, across the seas, and even to an Italian convent. What surprised me in my research? When I first chose the time, I needed a famine year, and I landed on 1315. As the story idea continued to evolve in my head, I was hoping the time would coincide with some of those Catholic saints, which it did. And I knew that Dandelion would love to dance, especially as a child. However, I didn't think that I could incorporate any sort of worship dance as I'm involved in it today. I had always been led to believe that dancing as worship existed in the Old Testament and then faded away never to return until approximately 1970. Ha ha. Boy, was I wrong. One day after I had the idea for my book but before I started writing, I was wandering through the library and a book caught my eye: Dance as Religious Studies. So I picked it up and brought it home. In it, I discovered that dance as worship existed throughout the middle ages, coming and going in waves until the enlightenment period when it finally fell out of fashion. Generally, it would thrive for a while until someone would get carried away or a new pope would discourage it, and then it would wane. But it was always around in some form. Finding that book was definitely a God thing. And it allowed me to incorporate something that I love and that has changed my life more fully into the book. DeAnna: Yeah, it's really interesting how things that I think God meant us to do (like worship Him with our whole selves, including our bodies) gets misinterpreted and misused and repressed, but it always comes out anyway. I'm not a dancer per se, but I do dance sometimes when I worship (as long as nobody but God is watching) and it's glorious. Did you find yourself modifying some historical realities for modern sensibilities? I think that language has changed so much that, if we wrote the way our characters actually spoke, nobody would have a clue what they were saying. And there's that whole hygiene thing I just was not going to deal with. True or not, my people were going to take baths and have decent teeth. Of course, since my medieval books are not set in a real place because I wanted to have my own history and royalty, I had a little more latitude in what was and wasn't going to be "real." Dina: I didn't even try to use medieval speech. As far as I'm concerned, Middle English is foreign language. I did debate on all the 'tis, 'twas, forsooth, type stuff. What I found in my research was that standard romance novels tended to use them, but historicals, like Philippa Gregory's Tudor novels, didn't. So I didn't use them either. I just tried to give an older British sound to the speech, and I tried not to use words or phrases that didn't exist by the time Modern English standardized around the era of King James. As for the hygiene issues, I actually enjoyed exploring that, although I did it more from the perspective of her contrasting her peasant life with her new life in the castle. Once she escapes from the village she discovers the wonders of baths, hair brushes, tooth scrapers, cosmetics, skin creams, and even indoor plumbing. And when she's in London, I do talk about some of the health and hygiene issues there, although she lives in a nice, upscale townhouse neighborhood. If I stretched anything, it's just that it would have been so unlikely for a peasant girl to become educated and travel the way she did. But I was careful to set up the story so that it was technically possible. I think there have always been beautiful women who have found ways to climb the social ladder. DeAnna: Middle English IS a foreign language! It's funny that some people say Shakespeare is "Old English." Ummm, no. It's modern English, but it's just old enough to sound a little strange to our modern ears. Most of the words aren't different. I guess I wanted to give my dialogue enough difference to be medieval sounding without being stiff or too confusing. I wanted it to have a little music in it, too. And, yes, I think class constraints would have made it hard for a peasant to rise above her station, but hard doesn't mean impossible. There are plenty of true examples of people who did break away from what usually happened. And, of course, beauty opens a lot of doors. Of course, great beauty can be a problem, too. Did your heroine have difficulties because of her beauty? Dina: Ah, an excellent question no one has ever asked me before. Her beauty does cause a lot of problems and even some danger. I don't want to give too much away, but at some point she begins to fear her own beauty and hide behind veils and frumpy clothing. Later, one of the men in her life uses that fear of her beauty to control her. I loved getting to explore this issue. Women are so obsessed with beauty, but beauty is a double-edged sword. It opens many doors, but it also causes jealousy. In addition, men often seek to control and possess beautiful women at any cost. Think back to the story of Abraham and Sarah in Egypt or Helen of Troy. Dandelion is also afraid of her own passionate nature, which is related to her fear of her beauty. DeAnna: I think the very beautiful also have a problem with not feeling valued for who they really are instead of for how they look. I know the hero of my first book had a real problem trusting women because he didn't think they saw anything but his looks and his royalty. Of course, he had other issues and felt that, if someone did see him for who he really was, she could never really love him anyway. Poor baby. Dina: Yes, Dandelion certainly faces that with Gottfried, the stoic knight who first brings her to the castle. It's a whirlwind courtship and he never knows her for who she truly is. Overall, people are people. Whether in the middle ages or today. We have the same struggles and heartaches and challenges. We share the same emotions and shockingly similar spiritual journeys. My book deals with the true meaning of love, worship, intimacy with Christ, and inner-healing. It also deals with ambitions, passions, and fears that are common to all of us. So while a book might be set in the far away medieval times, I think readers will still find much that they'll relate with. DeAnna: Exactly. No matter how we dress them up, if our characters don't act like people our readers can relate to, then we haven't done our job. Thanks for the chat, Dina. I'm very much looking forward to reading Dance of the Dandelion. I've heard only wonderful things about it! 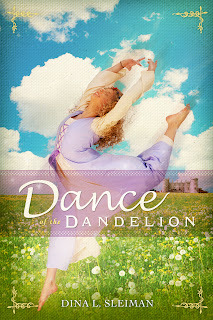 Find out more about the Dina and Dance of the Dandelion HERE. I see "the Dina" again. Is this a typo or is this a dangerous trend? I really admire all the lovely details that draw the reader along Dance of the Dandelion. Other than the plague, etc, the Medieval period seems like a charming place to be! I promise, as your peasant baker, I have washed my hands this week, so don't worry about hygiene on my account. our readers should note that DeAnna has her own noteworthy medieval fiction. Highly recommended (see her signoff bio at the bottom of her post!) If you like this period for fiction, let us know! Last year we were in Florida on vacation having dinner at the Medieval Times Dinner and Tournament and you should have seen the big smile on Dina's face the whole time. She showed us how we to eat using our bare hands and was filling in for us a lot of other details about the arena and the event. She felt right at home and even blushed when I took a picture of her with The Knight of our section at the end of the dinner. Dani - was Dina in period dress? I'd love to see that photo of her with the knight. Good interview, Dina and DeAnnna. It's more like a conversation than an interview and I feel priviliged to have been invited to join you. Deb, yes, DeAnna's books are wonderful. And my books is set a little before the plague, although it is already ravaging the Far East, so there is some foreshadowing of it's coming. If I do a sequel, it will start after the worst round of the Black Death, but the plague will play into the plot without us actually having to endure it. Yeah, I felt a little silly playing groupie to the read and yellow knight, but I was glad to get the picture. No, Anita. I wasn't in dress. I didn't see anyone in period costume when we went. As for the picture, my husband would need to find it in the abyss of hundreds of thousands of pictures on his computer. Oh, Dani, it would be so cool to see that picture! I've been to Medieval Times a couple of times, but it's been SO long ago. I wish I could go again! You know, Anita, I really enjoyed just chatting with (the) Dina about reading and writing medieval stuff. It's not something I get to do much. I'm glad you enjoyed the talk. Maybe all the Inkies should just have a writing chat together. Or maybe something targeted: characters, plotting, dialogue . . . That would be fun! One of the first historical novels I ever read was a medieval, and I simply fell in love with the genre. I, however, am not sure I could right one that seems authentic, and yet with characters readers could relate to. You did a wonderful job of that, Dina. Thanks, Suzie. I'm a very intuitive writer. Either the character and story pop alive in my head or they don't. This one certainly did. Love your chat guys. And DeAnna I think doing this more often is a great idea. I've been trying to figure out why the medieval period seems to have fallen out of fashion in the Christian market, and I have to wonder if it was because so many secular romances were set in that time period for such a long time that it got a bad rep? No idea, really. Just speculation. I'm just glad they're starting to sneak back in. You guys must be on the cusp of a new trend! Lisa, part of the reason is that the characters have to be Catholic, and most CBA readers are not. But also just that it's so foreign to us today. DeAnna dodges the Catholic issue by setting hers in a fantasy setting, and also by having her main characters dissidents to the predominant religion. In mine, I show both good and bad sides of the church and that my character is changed by an authentic and personal relationship with Christ, not by religion. You know, Lisa, I think part of it may be the "bodice ripper" image so many people have. And, let's face it, they're certainly out there. But I think, too, (and this is something my original publisher mentioned) is the perception that they're "too Catholic." Well, obviously, and not to say there weren't other schools of thought back then, too, "the Church" of that time was Catholic. Evangelicals can sometimes be uncomfortable with that. I did in some ways address that in my books by having my main characters be looked on as "heretics" somewhat for their beliefs, because I couldn't ignore the reality that there was not a mainstream "Protestant" faith at that time. But that was one of the advantages of me not tying my stories to a real place. If I had chosen an actual historical setting, I would have had to deal with the issue differently. Sounds like the Dina made great use of the religious realities of the time. The other problem is that a lot of readers equate "medieval" with "fantasy" -- sorcery and unicorns and dwarfs and so on. And that's a whole different subject. But I do hope medieval has a comeback. For me, the period has such enormous opportunities for drama and passion and pageantry. It's like no other. Hey, all. I added the requested picture of me with the knight in shining armor to the post. I hope you get to read it too. We're holding an as yet little advertised giveaway this week. Come back and add your email address if you'd like to enter. I love the picture, Dina! Thanks for sharing it. Nice interview--and I missed commenting on yesterday's somehow. Oops. I was enjoying the comments about faith in medieval times. I remember, from some old church history classes, references to believers during this time period, who held to many of the doctrines that we often think sprang into existence in the reformation. I know they were often branded as heretics. But I would like to believe that a real, vibrant personal relationship with Christ was transmitted verbally by Christians in that time period. I remember watching a wonderful movie about St. Francis in college. It was probably my first introduction to the vibrant relationships with Christ many medieval Christians experienced. Loved it. He is a handsome dude. That hair is a killer. I might have to shop for a wig. Well, actually his hair was all wet and sweaty after being in his helmet for the entire tournament. LOL. Oh, Dina. That photo's a keeper for sure. Dani said, He is a handsome dude. That hair is a killer. I might have to shop for a wig. That reminds me of when I put the photo of my hero Dan (fm Emma's Outlaw) as my screensaver. Picture this: a cowboy with long, black hair and trimmed beard, wearing an unbuttoned buckskin jacket (yes, he's bare chested) and a red bandana while caressing the horse looking over his shoulder. Within days of hubby seeing my screensaver, I realized he was growing a beard. When I enquired, he said it was so I could take a photo of him with his western garb and use that as my screensaver. He shaved off his beard a week later after coming to terms with its color - grey. Ha ha. Great story, Anita. As to the Comment that the Medieval period was a time 'before relgious division/schism' I fear this is not the case. There was a massive religious, Theological and cultural divide between the Roman Catholic and Eastern Orthodox traditions in the Middle Ages, which is part of the reason why the Byzantines could never really get on with the Western Catholic church. Also in Early Medieval Britain there was division between the 'Celtic' (or more correctly Romano-British) version of Christianity and the Roman Catholic tradition. 'Medieval times' I have heard of, but I am the more gritty, Battle Recreation, Hog roast cooked on a spit sort of girl. Then I do have an unfair advantage in that degree. I live in England, and have a Castle a few miles away with a Historical Recreation group that visit regularly. Ah, Anna, thank you for bringing all your expertise. I would love to attend a more authentic medieval presentation. And yes, you're right of course about the religious divisions. I am aware they existed, but the arguments and issues were different than those we have today, so that allowed my to avoid our current petty little disagreements. I do remember the reading the works of 8th century Northumbrian Monk Bede in which relates at great length the 'correct' method of dating Easter. That seemed VERY petty, tedious, and pointless to me. My Lecturers reliably inform me is was a very important issue though. It's interesting the ridiculous things religious people find to bicker over. No wonder the Bible warns us against this. Guess they missed that part, huh? I'm no expert Suzie, merely a student who has been willingly immersing herself in Medieval studies for years. Crazy, no? I am studying the Carolingians, but my knowledge of Ireland is sparse at best, and mostly non-existent. Also Im not entirely sure exactly what era you mean. There is the Life of St Columba which is 6th century i think, but I havent read it. I would just suggest trying to find Chronicles, Saints Lives and whatever Books you can find on Ireland, Britain and Europe in the early Medieval period. My knowledge of the conflict between the Irish/celtic and Roman churches is Limited to Britain I fear, and is mostly based on the works of English monks. I know that one of the Saxon Kingdoms Northumbria was converted in part by missionaries from Ireland in the seventh cenruries, and the conlict arose because some Kings/Queens were converted by Roman missionaries following Augustine. The only other thing I know is that Ireland was converted by Patick and his succesors who were followers of some form of Romano-British Christianity which was perhaps not quite the same as Catholicism. Thanks, Anna. I sure spelled Carolingian wrong. I keep catching myself doing that. I'm actually looking at Ireland before and after the Carolingian era, and their role in preserving art and literature, as well as their role in spreading Christianity and WHY there is so little known about it. I am loving reading about the illuminations. That is interesting I have to admit, but I personally believe that the Role of some of the Non-Celtic people's of Britain in preserving civilisation in the so called 'Dark Ages' has been understated. For example, one of the most Prominent scholars in Charlemagne's court was an Anglo Saxon named Alcuin on York, and so many important works of poetry, litetature, art, history, and other texts like legal codes were produced in Britain at this time. So I would day the idea that the Irish alone preserved Art and Literature whilst all the other peoples of the British isles were Heathen Barbarian Savages is something of a myth. Anna, I should get your email so I can check with you if I write more medievals. Sadly, as we probably addressed in one of the articles here, Christian medieval novels are hard to sell, but things are opening up in the teen market. You so DO NOT have to check with me Dina, and you probably wouldn't want to either. Im VERY Pedantic and would annoy you before long. Im flattered by the offer though! Really I admire Fiction writers, I lack the skill for that sort of thing. I have to agree with you, Anna. After all of my research, I came to the conclusion that there is a lot of myth and legend intertwined with truth, and that is perhaps the reason it is so difficult to find scholarly text regarding Ireland in this context. There ARE some out there I'm sure, it is just a matter of knowing which ones & where to look. Unfortunately I know neither. However, some of My Professors are experts in that period and I could ask them. I fear I've Hikacked this Thread and taken everyone off Subject. This was entirely unintentional I gaurantee, but there are lots of interering people. For those so whose might be interested I have a Blog on all Things Medieval. No shameless self-promotion intended. Thanks for letting us know. I'll be sure to check it out. Anna, I don't think you've hijacked it at all. You just enhanced our discussion. I'll be checking out your blog! Seriously we love our research and anyone who is a resource of information risks being pestered! So true. Stop back anytime, Anna. We don't all write medievals, but most of us love history. Awww, thanks I was afraid I was annoying people, nice to know I was not. As you can see I am passionate about History, and love to talk to others about it. Im afraid I have not written on My Blog for over a month, too busy with reading and essays. Dina, I intend to seek out the Kindle edition of your book when I have money again. The Scotland idea sounds interesting Dina, as does the setting in the time of the plague. There is a story told actually, that when the Black Death came to England the Scots were positively delighted to hear about the misfortune that had befallen thier enemies, and decided to take the oppurtunity to Invade England. The plan rather backfired though because not only was the invasion repelled, but the Scots soldiers got infected and carried the plague back home with them. I am not entirely sure if the sotry is true, it might just be apocryphal, perhaps invented by a Chronicler as a Moral warning against taking delight in the suffering of one's adversary. I know Scotland did invade several times, so there might be some truth in it. Who knows. Sorry I meant 'story' not 'sotry' apologies for all the spelling mistakes, one of the disadvantages of fast typing. Hmm...that Scotland story is interesting. That's £2.85 on Amazon.co.uk. I will get it but I have no idea when I will be able to read it, what with four assingments due next month and a liral pile of books to get through for them.